The memorial plaques put things in perspective. Exquisite views! ...I hope that the girl posing doesn't fall backwards over the fence. Pity that so many people now visit wonderful places just to get photos for themselves to put on Twittersnapchatinstagramwhatthehell. A friend who leads walks in the English Lake District tells me that the main complaints he gets from guests is that there's no phone signal in the mountains. I mean what's the point of wonderful scenery if you can't show everyone your carefully composed selfies? Such a great vantage point and the plants look exotic. Beautiful! I am sold on Perth! What a lovely place. The weather looks so much better than the 2°C here. I can see why this would be a popular place for taking photos. Besides that perfect view of the city, you have that perfectly blue water and those perfectly gorgeous blooming plants. It's a photographer's dream! That species of magnolia doesn't have too many flowers but it is quite a spectacular tree and the flower scent is very pleasant. Good to get the Quay in one photo. I'd love to have my pic taken there, Grace! I wish it was magnolia season here. Awesome views, and I love the photos of all the people enjoying the scenery! Do they have ice coffee in Austrillia. We had a monster Southern Magnolia in our first house in California. It was fabulous but we felt we needed hard hats when the blossoms came apart and the center part (pistils?) started falling. That girl sitting on the fence for a pic, oh, my! 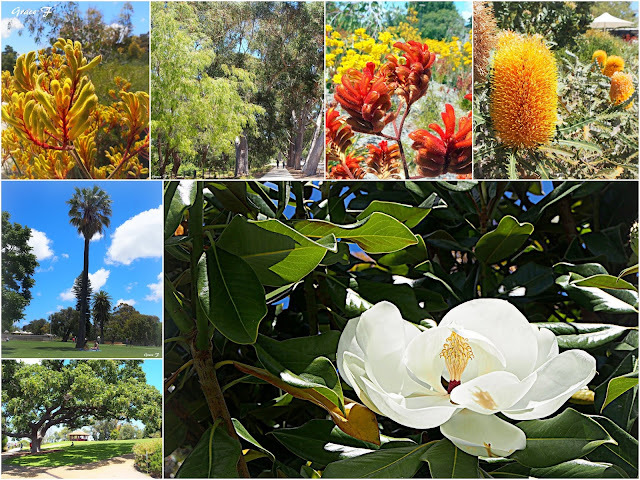 I love Kings Park, too, and the flowers just again make my dark day (as in no sun, no worries, Grace). I remember that cafe, great spot. All flowers whether native or exotic enchant me. Um lugar muito bonito e agradável. Botanical cafe. That must be an amazing place. The flora is lovely. We have magnolias here. Did you know they have been around before bees, so they get pollinated by beetles? That certainly is a fabulous view. When I stayed with my cousin in Attadale, I didn't really have much chance to look around the city of Perth itself. We went to stay in Augusta at a cottage, further south. The magnolia is gorgeous, as are all those wonderfully different Australian blooms. They picked the perfect place for a few portraits. What a gorgeous day to be out learning and viewing!